Harmony Enterprises and its employees have a long history of giving back to our community. After all, our Core Values are centered around our Core Purpose of Career, Community, and Culture. Harmony Enterprises supports several area groups, including our local EDA, Chamber of Commerce, Harmony Area Community Foundation, Relay For Life, regional and state manufacturer’s forums, school organizations, regional theaters, and more. Our employees are actively involved in civic organizations, benefit groups, and act as Junior Achievement volunteers. Recently, a family in our Harmony community learned that their one year old daughter, Gabby, was diagnosed with an aggressive form of Leukemia. This terrible disease requires that the bright-eyed toddler be in the hospital for months at a time, receiving multiple rounds of chemotherapy and other types of treatment. During what is a frightening and uncertain ordeal, the family has remained positive and resilient. The have demonstrated a level of grace and compassion rarely seen by those in good times, let alone when challenged with the demands of their new “normal”. Equally as impressive has been the community support, not just in the immediate Harmony area, but all of Minnesota and Northeast Iowa. Countless individuals, businesses, and community groups have rallied to host benefits that provide support and financial assistance to help defray mounting medical costs. People have done a variety of things to contribute, such as selling ribbons and tshirts, hosting benefit breakfasts, organizing 5K runs, and even creating billboard campaigns! One Harmony Enterprises employee recently joined the fight in his own unique way. New Business Development Manager, Lane Powell, is a former instrumental music educator who is an active composer, honor band conductor, and clinician. 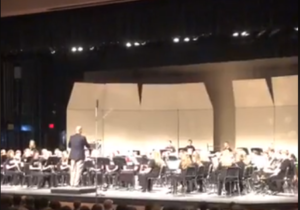 The CMBDA Honor Band in Elk River, MN, contracted Mr. Powell to conduct their annual honor band and commissioned him to compose a piece for the event. Lane seized this opportunity as a chance to pay tribute to the local family in need, while earning money to donate to their cause. Gabby Brown, to whom the piece, “Gabby’s Gifts” honors. Like everyone who has followed Gabby’s story, Lane was inspired by the positive attitude of the family, and the shining spirit of this little girl. The best way to honor her, and the gift of inspiration the whole family gives back to our community, he thought, was to compose a lullaby for concert band, and donate 100% of the proceeds to the family. “Music captures the moment forever, and provides a bit of peace and comfort for those who allow themselves to be a part of it,” Powell stated. The grade 2.5 concert band ballad is entitled, “Gabby’s Gifts (Through The Eyes Of A Child)” and was premiered with the CMBDA Honor Band on Saturday, March 12th, at Elk River HS. Since then, it has been edited into its final draft and promoted on social media. It has sold over 65 copies in just 6 days! The score and parts are only $50. Many concert band pieces are much less affordable and can range from $75-100 each. It’s sent electronically in PDF form so band directors can print and copy as many parts as needed. Published music requires that parts be original, so ensembles typically end up buying more than one copy of each piece, further depleting their already low budgets. The music is accessible for junior high, high school, college, and community bands of varying ability levels. It’s a wonderful tool for teaching and performing with lyricism and expression. You don’t have to be a school band director to buy the music. In addition to instructors, several community members, administration, and alumni have made donations to their Alma maters in honor of Gabby. Some people have even purchased it as a memento for loved ones. You will be supporting the creation and development of new and original concert band music. 100% of the proceeds go to benefit Gabby and her family. Steve Cremer, President, Harmony Enterprises, presents his donation to UW LaCrosse Bands to Jeff Meyer, UW LaCrosse Development, in honor of Mr. Cremer’s Alma mater. The best way that you can help would be to use this story as a call to action to channel your own gifts to give back to your own community. However, if you would like to support the “Gabby’s Gifts” project and order a copy of the music, please email the composer at lpowell@harmony1.com. You will be sent instructions regarding payment and you will receive the electronic downloads once payment is received. As with all of our data privacy policies, you will not be contacted in the future for any other reason than to complete this music purchase. This month, a regional TV station did a wonderful job of capturing the meaning behind this project. Click Here to see the video feature. Harmony Enterprises manufacturers balers, compactors, and beverage extraction equipment for satisfied customers all over the world. We care deeply about the quality of our products and services and carry that commitment into our Career, Community, and Culture. If you would like to learn more about our products or customer service, or about how our company and its employees support our community, please call us at 800-658-2320 or Contact Us today!